Investing Advice And InformationEmploymentIs Trump Wrong about U.S. Trade with Mexico? Trump has attracted a lot of voters — though probably not enough to win the election in November — by attacking hallmarks of American success, the principles of free trade and relatively open borders. We are often characterized as a melting pot, a nation of immigrants who are all seeking the American dream. Trump wants to change that and build walls around America, rather than bridges. He threatens to impose a 35% tariff on all Mexican goods to pay for the new border wall. Is Trump right? A couple of years ago, before Trump announced his candidacy, a report on “NAFTA, 20 Years Later,” came out from the Wharton School of Business — the school that Trump attended as a graduate student in 1968, where he majored in economics! Free trade is one of the tried-and-true principles of economics, and 98% of economists are in favor of it because they know it increases trade, employment and consumer choice on a net balance. 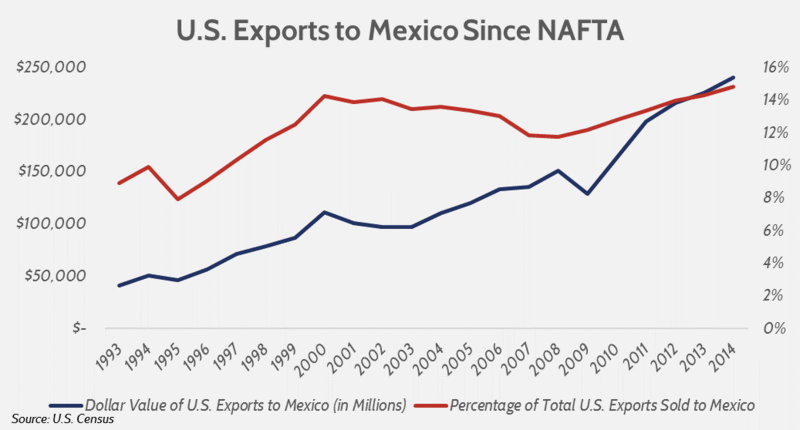 Indeed, despite the would-be Cassandras like Ross Perot who predicted that NAFTA — the free trade agreement between the United States, Canada and Mexico that went into effect in 1994 — would prove detrimental, NAFTA has overall been a YUGE success. The auto sector has seen the most dramatic change. According to the Wharton report, Japan exported almost twice as many cars to the United States as did Mexico in 2008. Now, however, Mexico exports close to two million vehicles to the United States annually, surpassing Japan and Canada. By 2020, 25% of all North American vehicle production will take place in Mexico, compared to 10% in Canada and 65% in the United States. In case you missed it, check out my e-letter column from last week about the debate on “The Elections and Your Portfolio” that I moderated. I also invite you to comment on this article below. This week, New Jersey Gov. Chris Christie took an unpopular stance by vetoing a bill that would increase the minimum wage to $15 an hour in New Jersey by 2021. The bill was passed by Democratic lawmakers and is similar to what has been done in New York and Connecticut. Christie said the $15 hike “would trigger an escalation of wages that will make doing business in New Jersey unaffordable.” Already, some restaurants and other businesses have been forced to close in Seattle, where the minimum wage has been $15 for some time now. Raising the minimum wage will also cause unemployment among teenagers, minorities and the unskilled. No wonder the unemployment rate is over 50% among young black males. Wow, then why not raise the minimum wage to $25 or $50 an hour? The minimum wage increase will, no doubt, increase the income of those who get the higher wage, but it will also result in more poverty for those who are laid off. Yes, it will pump more dollars back into the economy, but it will also raise the costs of doing business — which will pump fewer dollars into the economy. The fact is that there is no free lunch when you artificially raise wages by government edict and interfere with labor contracts. O “Investing in Art & Rare Tangible Assets Seminar,” New York, New York, October 24-25: The Oxford Club, led by investment writer extraordinaire Alex Green, will be hosting a special two-day seminar on investing in art and collectibles. I’ve just been added to the program to speak on “Investing in Rare Financial Books for Fun and Profit.” I’ve been a collector of rare financial books for years, and have profited handsomely. (I’ll also reveal my secret way to save 20-30% off all artwork and collectibles.) Other speakers include Geoff Anandappa and Richard Gladdle, of Stanley Gibbons, to discuss rare coins and stamps…James Forsyth on investing in wine… and Marsha Malinowski and Clive Moss on investing in fine books and manuscripts. 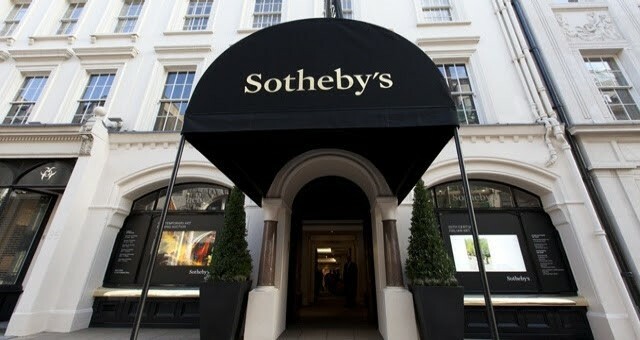 The seminar will include a private tour of the Metropolitan Museum of Art by its President Daniel Weiss, and a visit to Sotheby’s. What fun! For more information, please click here or contact Oxford Voyager Club Concierge Kiara Laughran by phone at 443.708.9411 or by email at voyagerclub@oxfordclub.com. She will be happy to help you. Investment expert Doug Fabian introduces this large, liquid high-dividend-seeking fund that is globally diversified and carries a high current yield.